They say that beauty is in the eye of the beholder, and for women who increasingly spend their days connected to digital content, beauty comes in the form of high-quality visual images and videos. As part of our 2015 Evocative Web study, POPSUGAR Insights explored the relationship between publishers and brand marketers and the emotional connection that both can create via the use of high-quality visual imagery. We first interviewed digital marketing, design, and creative experts to get their perspectives on the importance of high-quality visual content. Every one of them mentioned that in today's age of shrinking attention spans, mobile-first consumer content consumption, and real-time trends, images rule and offer brands and publishers a unique opportunity to make an impactful first impression, but the images they use need to be high quality to deliver the "pow" that grabs a woman's attention from the first experience. But what constitutes high quality in the eyes of everyday women? Our research found that 67% of women prefer images that are high resolution, and 55% felt that an image that did not appear cluttered was the definitive factor. 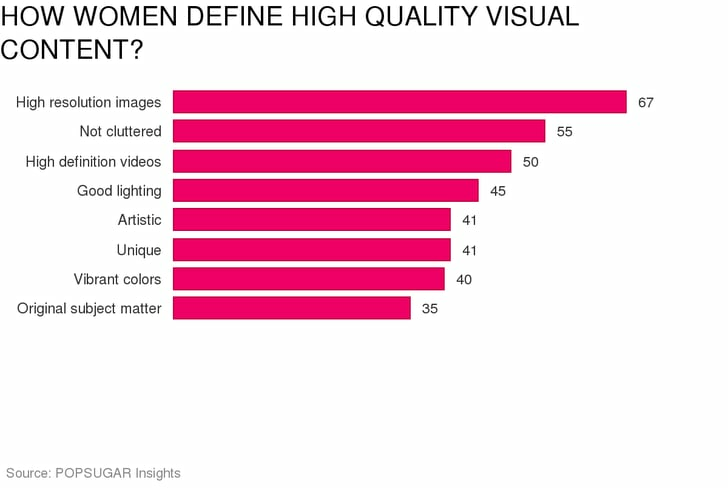 Women we surveyed also spoke about the aesthetics of the visuals themselves, mentioning photos that feature good lighting (45%), are artistic (41%) or unique (41%), include vibrant colors (40%), or contain original subject matter (35%). Eighteen- to 20-year-old women were more likely to select high-resolution images and high-definition videos as the defining aspect of high quality, while women who are very interested in fashion, beauty, and style content were more likely to say that an image with good lighting was more important than fans of any other lifestyle vertical. In general, younger women under the age of 24 were more likely to have strong opinions of what high-quality content means to them.